A Kid Place - Furniture, Toys, and Essentials for Kids of All Ages! So many choices! 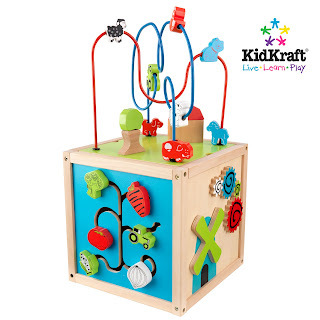 Our Bead Maze Cube by Kidkraft gives the young boys and girls in your life 5 sides of fun to choose from. Each side of this great learning toy gives young kids a different activity that will help with the development of color recognition, shape recognition, and eye-hand coordination. Dimensions: 10.63" x 10.51" x 19.6"
All paints and finishes used on Kidkraft wooden furniture & toys are lead-free and non-toxic. Should Parents Lower Fever in Children? Do Only Children Have Worse Social Skills?